To identify the tree species of the Forest Theater area and estimate relative health. Based on the species composition and performance, develop strategic recommendations for care of existing trees and project recommendations for future planting. Each tree was identified as true-to-species as feasible. Condition of trees was based on density of foliage (crown), presence of dead branches and trunk injury. Each tree was afforded a “low”, “moderate”, or “high” rating. Also, the understory and ground-floor vegetation was cataloged. Trees in the lawn area on the north side of the forest (woods) were also evaluated. Table 1 lists the species, number, and condition. This encompasses areas F1 – F6 plus the Lawn area. There were approximately 223 trees accessioned with 29 (13%) rated “high”; reciprocally 115 (52%) rated “low”. Acer rubrum (7%), Carya tomentosa (6.9%), Fagus grandifolia (12%), Liquidambar styraciflua (17.9%) and Quercus alba (6.7%) constituted 50% of the total trees. It was extremely rewarding to witness healthy American beech (Fagus grandifolia), a species largely absent (3 of 1296) from Kenan woods. In fact, the American beech rated 74% in the “high” category. Liquidambar styraciflua had 47.5% “moderate” to “high” trees. Fifty-two percent of these Liquidambar styraciflua rated “poor” as many were about 80’ high with dead and senescing branches. In areas F1 to F4, seedling regeneration was abundant on the forest floor. The presence of Acer saccharum, Cornus florida, Fagus grandifolia, Fraxinus americana, Ilex opaca, Magnolia grandiflora, and Quercus alba indicated excellent soil conditions and minimal disturbance. Obviously, the mature trees produced copious fruits and provided the inoculum for the next generation. In F1 to F4, invasive exotics including, Elaeagnus pungens, Elaeagnus umbellata, Euonymus fortunei, Firmiana simplex, Hedera helix, Lonicera japonica, Rosa multiflora and Vitis spp. should be eliminated. Also, poison ivy, Toxicodendron radicans, is abundant and out-of-control. It grows next to the walk by Country Club Drive and is certainly a liability. The woods in F1 – F4 are quite healthy and rich containing about 30 species requiring only clean-up and removal as discussed. Several native understory shrubs like Vaccinium stamineum, Viburnum acerifolium and Euonymus americanus are welcome inhabitants and should be protected. Table 2 lists the species, number and condition. This area (F1 to F4) contains 164 (out of 223) or 74% of the total trees (Table 1) recorded for the Forest Theater area. The American beeches are magnificent (79% “high”, 21% “moderate”) and should be preserved as they assume their rightful place in this climax forest. leatherwood; Fothergilla taxa; Hydrangea arborescens, smooth hydrangea; Hydrangea quercifolia, oakleaf hydrangea; Lindera benzoin, spicebush; Rhododendron species with emphasis on native, deciduous azaleas (complete collection) as well as the evergreen R. catawbiense, R. chapmanii, R. maximum, and R. minus; Stewartia malacodendron, silky stewartia; S. ovata, mountain stewartia; and native Viburnum species (in quantity). Collaboration with the Botanical Garden could result in a wild-collected, taxonomically-documented assemblage of native, flowering shrubs/small trees that serve aesthetic and educational purposes. Table 3 lists the species, number and condition of trees located in the Lawn area north of the native woods (F1 – F4). 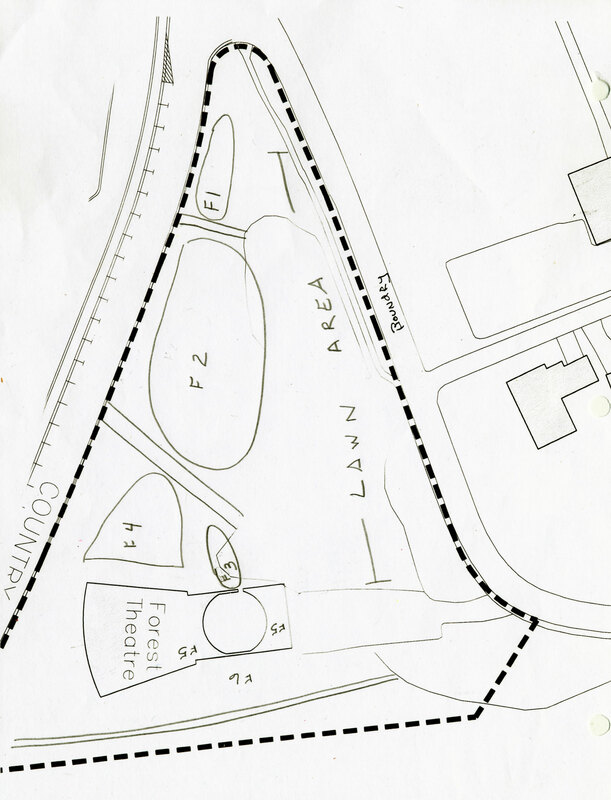 This swath starts at the tip of the triangle formed where Country Club Drive and Boundary Street intersect and three Ilex ‘Mary Nell’ are located, and extends to the west side of the parking lot, including picnic tables, to the actual theater structure. Thirty-five trees comprised 15.5% of the total. Only two rated “high”, Fraxinus americana and Liquidambar styraciflua. Twenty-seven percent rated “low”; 69% “moderate”. This area should be considered in concert with F1 – F4, particularly if the new path and native shrub understory plantings are implemented. Removal of the “low” rated trees and pruning of the “moderate” and “high” rated trees would dramatically enhance aesthetics and safety. Assess available lawn space after removal/clean up and then add species that mirror the F1 – F4 area. Recommend a short list of Acer saccharum, Fagus grandifolia, Liriodendron tulipifera, Nyssa sylvatica, and Quercus alba. Several strategically placed Pinus taeda, Pinus glabra and/or Pinus strobus are warranted. supports are necessary since these species affix themselves to structures by “adhesive” means. The 24 trees rank about 33%:67%; “low”:“moderate-high”. The slope next to the east seating area is a shambles with small regenerating redbuds. Several trees were removed as evidenced by stumps. Erosion is a problem. Adding a screening border composed of Viburnum rafinesquianum, Viburnum rufidulum (larger) and Viburnum dentatum would stabilize soil and provide enclosure. Behind this “screen”, larger evergreen trees, Magnolia grandiflora and Pinus spp., could be planted. Several tree planting pits, now empty, are present in/near the theater seating areas. Consider replanting with native oaks like Quercus coccinea, Quercus falcata var. pagodifolia, and Quercus nuttallii. Behind the theater, a grouping of large conifers would form the backdrop. Fast-growing pines are an option, perhaps mixed with Magnolia grandiflora ‘Claudia Wannamaker’.